Tomorrow is St. Patrick’s Day so it’s fitting that today I write about an Irish whiskey I had not tasted till about a couple weeks ago. Kilbeggan has been on my radar for a while so when I attended Julio’s Liquor Store, Go! Whisk(e)y Weekend 2015 a couple of weeks ago and saw it there, I knew it was one of the whiskeys I needed to try. Before I go further into Kilbeggan, I wanted to lightly touch upon Julio’s Liquor Store, Go! 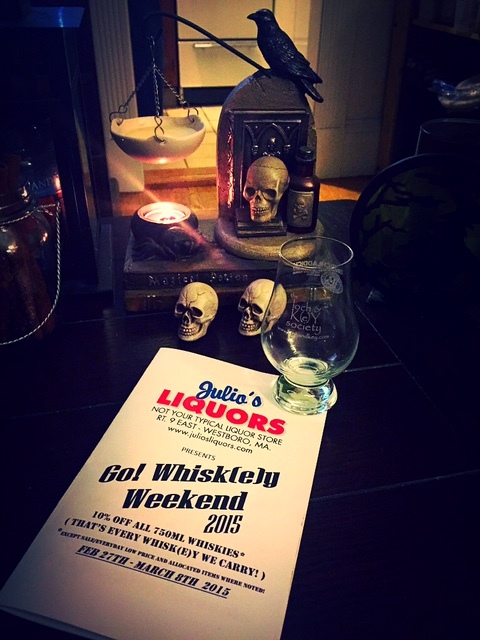 Whisk(e)y Weekend 2015. Julio’s is located in Westborough, MA. This years Whisk(e)y Weekend was far more than just a weekend as festivities began on Wednesday Feb. 25th and went through Sunday March 1st. The events featured seminars and plenty of tastings, which included over 350 whiskies from around the world. If you live in the Massachusetts area and love whisk(e)y, keep your eye out for next year’s event as it’s well worth it. My boyfriend and I attended the Sunday tasting and could not have been more pleased with the selections. Now on to my whiskey post! Matthias McManus founded the Kilbeggan distillery in 1757. The distillery unfortunately closed down in 1957 due to prohibition and the Irish War of Independence. It was years later that the Cooley Distillery bought the license to produce Kilbeggan again and started to produce the whiskey in 2007. More often than not you will hear Kilbeggan being compare to Jameson. Jameson was actually the first Irish whiskey I ever tasted in my life and goes back to the first years when I initially started drinking whiskey. I recall for one birthday party a while back, a few of my friends brought Jameson as gifts as they knew at the time I very much enjoyed it. Fast forward to today, I do enjoy Jameson but if you ask me to compare Jameson with Kilbeggan I will hands down say that I enjoyed Kilbeggan the most. I was very pleased with this whiskey. Truthfully, I was very surprised at how much I enjoyed it. This is a very tasty whiskey that will only set you back around $20 or so. For the cost, this is a great quality product. I highly recommend trying and since it’s affordable you can actually go out and compare the taste between the two yourselves. It’s a whiskey I can see adding to my whiskey collection as an affordable everyday whiskey.